As I drove home this evening, Mr. Muse and I amicably chatting along the way, I glanced down at the thermometer and saw “53”. Fifty-three glorious degrees. The sun was still high in the sky and I knew that I had a good couple of hours before it was dark. I had been contemplating whether or not to jump on the treadmill once I got home, but the promise of somewhat pleasant temperatures combined with sunshine after having a hectic week at the office made a walk around the block, all 3.3 miles of it, much more appealing. Mr. Muse was going to head out to his shop to work on “Super Secret Project #2” before dinner. Decision made. I changed into my walking shoes, put on a windbreaker, grabbed my gloves (it was windy afterall) and hit the road. For the first mile, with the wind and sun at my back I walked, I glanced with dismay at the trash washed into the ditch from meltwater a mile away. As I walked further, I watched the neighbors horses feeding on a new round bale in their corral and heard a rhythmic squeal; I couldn’t place the sound. As I pressed onward, my arms pumping by my sides, the squeal was louder and in my head I heard the swingsets from my childhood, the squeal of the chains as I pumped the swing higher and higher with my legs. I looked to the nearby farm, watching for a swingset and saw their old windmill twirling in the wind, squealing. By mile two, brief narratives were flitting in and out of my mind. The landscape, green with pine trees still held a desolate quality and though I don’t watch any of the popular zombie shows, the story in my head was one of post-apocalyptic proportions. The trash along the roadside, revealed by the melted snow, showed signs of human habitation… at some point. Maybe even now. A trio of turkey vultures wheeled silently overhead, scanning the fields and ditches for carrion left behind. The crunch of tires on the loose sand atop the slurry-sealed road could be a group of survivors who would rob me and leave me for dead or recruit me into their tribe. These dire thoughts didn’t last long as soon I was redirected to ideas more poetic. Last years leaves on the red oaks clung desperately to the branches, protesting each tug of the wind as they rattled, saber-like. The wind whooshed through the pine needles. Crows cawed in the thick forest. I was surrounded by the sounds of nature, blinded by the sun reflecting off of pools of melted snow and then I heard it: the call of the Red-Winged Blackbird. Instantly I felt Spring upon me, even though it officially arrived yesterday – I hadn’t heard the Red-Winged Blackbirds yesterday. Harbingers of spring, they’d arrived! The Robins had been about the yard for the last couple weeks, but the Blackbirds – they were how I knew that warmer weather would soon arrive for good. I took a deep breath, inhaling what now smelled like the damp earth of Spring. As I approached mile number three, I could swear I was hearing the trill of tree frogs. If I was going to hear them well, I’d need to stop and listen, but I was loathe to slow down. Smiling, I pressed on, the trills and chirps of the frogs that I knew I would soon be hearing for certain lightened my steps and I rounded the last turn for the final stretch home. I was met in the driveway by Mr. Muse. Super Secret Project #2 was finished but he was unsure where to put it. Such an impressive work needs to be put where it will be seen; it’ll go right behind the first yucca in the prairie as people enter our yard. Mr. Muse had had this idea in his head for a while, and while he works in wood and metal, and I work with words, sometimes what is inside our head must come out. 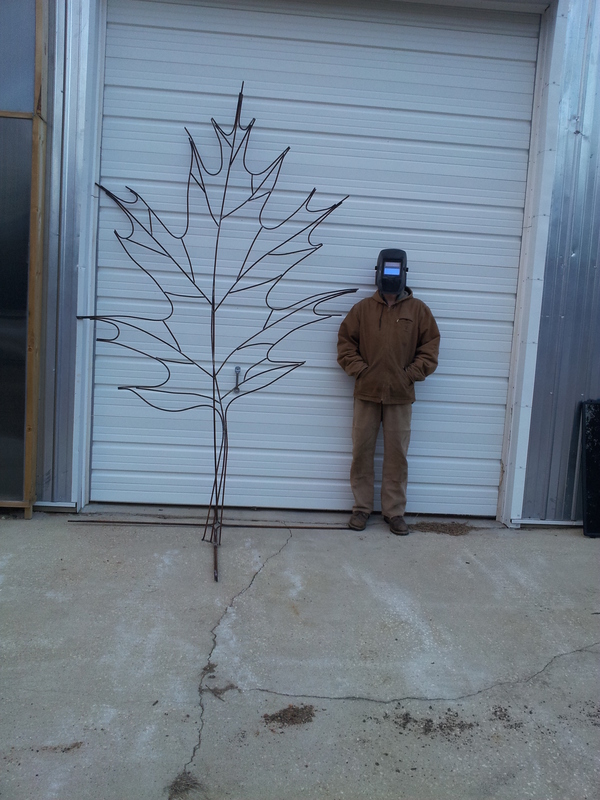 Mr. Muse and his very big Red Oak leaf. This entry was posted in Blogging, Fancy Coffee Friday, Musings, Personal and tagged Fancy Coffee Friday, metal yard art, narratives, Spring, tree frogs, welding, writing. Bookmark the permalink. Indeed. Sometimes. It simply must come out. Pretty damn cool, Mr. Muse! Thanks! And… I’m so sorry. The National Weather Service says that much of the abundant snow we got this winter didn’t contain much water… that’s sad. Mr Muse seems to have developed somewhat of a Cyclops look – I always remembered him with two eyes. Hmmm. Maybe my memory is fading – Cool sculpture though! I love the mystery project! And, yeah, there is NOTHING like being outside, moving about, to let the creative thoughts work into your head. I’m at peace & vividly thinking, all at the same time. I’m more of an “announcer” of projects, though most of what I work on is in plain sight. Mr. Muse is presently finishing up a new fire ring that he’s making with rebar – photos to follow!